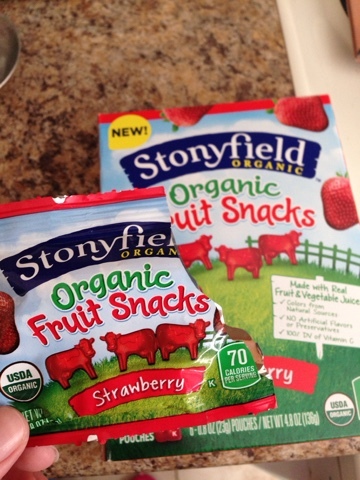 Have you heard that Stonyfield has ventured out of the dairy aisle with the release of their new Stonyfield Organic Fruit Snacks? Well they graciously sent my family some boxes of the fruit snacks to try. Now I don't regularly buy fruit snacks because I know dentists have heart palpitations when they see kids eating chewy, sugary snacks. Everything in moderation though, right? To be totally honest, I was a bit nervous that my kids wouldn't like the Stonyfield fruit snacks. I have those super picky kids that like things just so and I was afraid these might be a bit "too healthy" for them. After all, Stonyfield Organic Fruit Snacks are made with real fruit and real vegetables, have no artificial ingredients or preservatives, and contain 100% DV of Vitamin C. That seems like something kids could complain about, right? Well I was pleasantly surprised when the kids LOVED them. They gobbled them up in a millisecond! They were psyched to have them and I'm excited for a fruit snack option that I can feel better about purchasing for special treats. I even tried out a bag myself recently when I felt like I might be coming down with a cold and was consuming as much Vitamin C as I could get. I couldn't even tell you the last time I had fruit snacks. Maybe even never? They were really good! Oh, and they are shaped like cute little cows. What's not to love about that? So if your kids (or you!) are fruit snack fanatics, keep an eye out for them in your local grocery store! *Disclosure: This post was written in partnership with Stonyfield. As a YoGetter Ambassador, at times I receive free product and/or compensation. As always, all opinions are my own.